Artificially structured metamaterials could transform telecommunications, data storage, and even solar energy, says David R. Smith. David R. Smith led the team that built the world’s first “invisibility shield” (above). The shield consists of concentric circles of fiberglass circuit boards, printed with C-shaped split rings. Microwaves of a particular frequency behave as if objects inside the cylinder aren’t there--but everything remains in plain view. David R. Smith led the team that built the world’s first “invisibility shield” (above). The shield consists of concentric circles of fiberglass circuit boards, printed with C-shaped split rings. Microwaves of a particular frequency behave as if objects inside the cylinder aren’t there–but everything remains in plain view. The announcement last November of an “invisibility shield,” created by David R. Smith of Duke University and colleagues, inevitably set the media buzzing with talk of H. G. Wells’s invisible man and Star Trek’s Romulans. Using rings of printed circuit boards, the researchers managed to divert microwaves around a kind of “hole in space”; even when a metal cylinder was placed at the center of the hole, the microwaves behaved as though nothing were there. It was arguably the most dramatic demonstration so far of what can be achieved with metamaterials, composites made up of precisely arranged patterns of two or more distinct materials. These structures can manipulate electro­magnetic radiation, including light, in ways not readily observed in nature. For example, photonic crystals–arrays of identical microscopic blocks separated by voids–can reflect or even inhibit the propagation of certain wavelengths of light; assemblies of small wire circuits, like those Smith used in his invisibility shield, can bend light in strange ways. But can we really use such materials to make objects seem to vanish? Philip Ball spoke with Smith, who explains why metamaterials are literally changing the way we view the world. Technology Review: How do metamaterials let you make things invisible? David R. Smith: It’s a somewhat complicated procedure but can be very simple to visualize. Picture a fabric formed from interwoven threads, in which light is constrained to travel along the threads. Well, if you now take a pin and push it through the fabric, the threads are distorted, making a hole in the fabric. Light, forced to follow the threads, is routed around the hole. John Pendry at Imperial College in London calculated what would be required of a meta­material that would accomplish exactly this. The waves are transmitted around the hole and combined on the other side. So you can put an object in the hole, and the waves won’t “see” it–it’s as if they’d crossed a region of empty space. TR: And then you made it? DRS: Yes–once we had the prescription, we set about using the techniques we’d developed over the past few years to make the material. We did the experiment at microwave frequencies because the techniques are very well established there and we knew we would be able to produce a demonstration quickly. We printed millimeter­-scale metal wires and split rings, shaped like the letter C, onto fiberglass circuit boards. The shield consisted of about 10 concentric cylinders made up of these split-ring building blocks, each with a slightly different pattern. Arthur Nozik believes quantum-dot solar power could boost output in cheap photovoltaics. John Guttag says using computers to automate some diagnostics could make medicine more personal. I just wanted to know if this is the same material that was demonstrated on "YOU TUBE" about 6 months ago. The demo is absolutly amazing. Just go to "YOUTUBE" and search for "optical camo". There are several selections typically all less than a minute. Definitely a must see. Nah -- optical camo is simply projecting an image of the scene back into the scene. Wear mat white clothing and wham! you're sort of hard to see. Insurgents need only look for that pesky shining light from those computer projectors however. This article involves the clever use of materials that are on order of the size of the wavelengths of the electromagnetic radiation and so interact strongly with it. Lots of apps: Cleverly arranged, you could say, get a nearly flat surface that can focus light better than any existing lens. Grow such a lens right over the imager. Solar cells that lie flat but nevertheless "see" the sun as always directly over head. 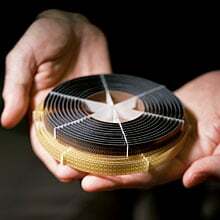 Optical filters that can very precisely alter, absorb or reflect given frequencies of light. Cool stuff. Wish you could by stock in researchers. I believe that Dr. Smith have made a great progress in negative refractive index material research that can be used for invisible techniques. John Pendry (J.B. Pendry, Science 312, 1780 (2006); 315, 1226 (2007)) presented a theoretical expectation that electromagnetic fields can be redirected at will by using the negative refractive index materials. A simple illustration was given of the cloaking of a proscribed volume of space to exclude completely all electromagnetic fields. Unfortunately, the negative refractive index materials do not exist in the nature. Artificial structures have been proposed and fabricated from metamaterials. Vladimir Shalaev first obtained negative refractive index metamaterials consisting of an array of pairs of parallel gold nanorods at monochromatic far-infrared wave in 2005. D. Schurig constructed the cloak using structured matamaterials, achieved at monochromatic microwave frequency. (D. Schurig, et al, Science 314, 977 (2006)). Recently, Henri J. Lezec achieved negative refraction at monochromatic blue and green frequencies using an ultra-thin Au/Si3N4/Ag waveguide. Smith’s group also made a great progress on metamaterials. Metamaterial are actually engineered by organizing the inductor/conductor type structures in a special composite fashion. A main problem for such metamaterial is that the obtained negative refractive index is only at special wavelength or MONOCHROMATIC wavelength due to its resonance structures with electromagnetic wave. This may be a fundamental structural flaw. Based on such metamaterial, we expect it may be no possible to achieve the negative refractive index in a continuous band or over a wide bandwidth. Is it true? I wonder if the Dark Energy & Matter that makes up the bulk of the universe (although we can only infer it's existance) could be hidden from us by a similar natural phenomenon ? How do we test it to find out? Then - what do we do with it if your idea is true? And then - how do we market it for present or future uses(s)? >And then - how do we market it for present or future uses(s)? could black holes be focusing visable light in the same matter as not to appear with current technology? Do you think we will ever isolate the graviton? Would dark energy be considered a paradoxical phenomenon that influenses the space time continuum?? If it does then it must influense the gravitational forces between heavenly bodies.